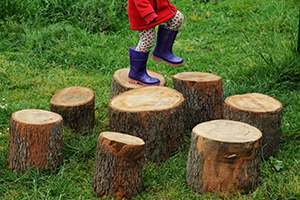 These stumps are cut from real, live, northern hardwoods growing on a sustainable farm in New Hampshire, and are beautiful specimens that will enhance your play environment and the experiences of your children. 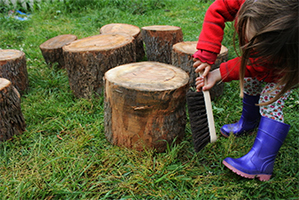 Your kids will be making up games and challenges, and negotiating with each other as they decide what to do with these beautiful, natural stumps each day. Sometimes they'll sit on them and just chat, sometimes they'll challenge themselves by stepping from one to the other, sometimes they'll make up games involving the stumps - sitting, standing, jumping, and sometimes they'll even roll the stumps to new locations, and set up an entirely different play scene. 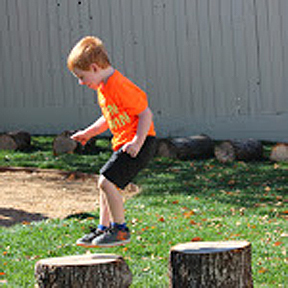 Children will learn balance and agility skills, learn how to handle their bodies to maintain equilibrium as they move from one to the other, and grow stronger as they roll and maneuver the stumps from place to place. 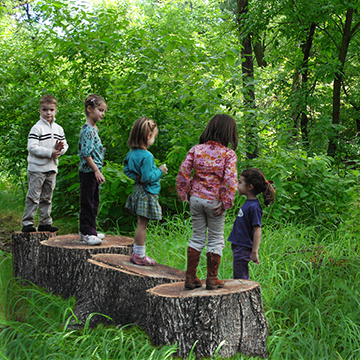 They will also learn what tree rings are all about, practice math skills as they count those rings to determine the age of the tree when it was cut for them, observe how the stumps change over time, and watch tiny insects make the stump their own play and living area. 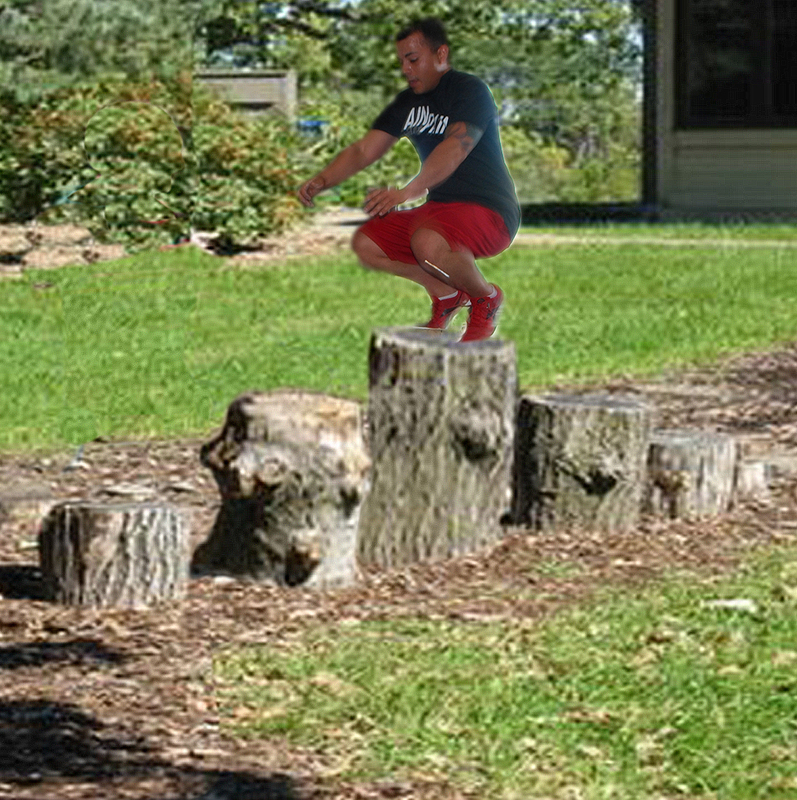 These stumps present constant learning moments. when the stumps are in the hot sun); and we want the children to see and observe the inevitable changes that will occur over a long period of time! So, during the season when the bark is “tight,” we will probably make the decision to keep it on. However, should it arrive on your premises without bark, it’s because we decided to take it off for the reasons above. We cut these beautiful, very affordable, REAL log stumps around 16”+/- diameter and 8” to 18” high (10", 12", 15", 18"). 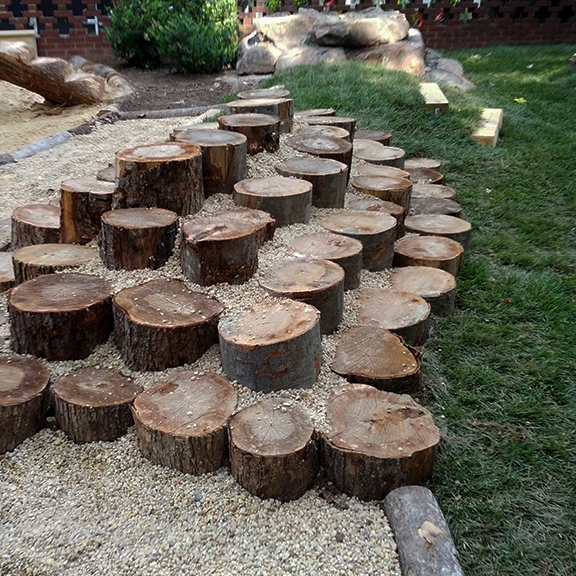 The picture below shows stumps arrayed as a mountain that encourages kids to climb up and down different heights, sit on them for a meeting, use them for dramatic play, and so on. The possibilities are unlimited!